Couch lawns have been a favourite lawn variety in Queensland for quite some time now. 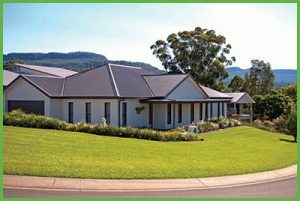 Their reasonable cost combined with their preference for our warm sunny environments, good drought resistance and quick repair capabilities all work in their favour. Couch grass has a fine leaf blade which mows beautifully and when the lawn is in great health with a dark green colour mowing can create that fantastic flat finish on our home lawns. Couch has undergone many improvements in the last twenty years with many new cultivars becoming available. These new hybrid Couches have a nice finish, good dark green colour with increased wear and repair abilities, and have become the driving force for the popularity Couch continues to enjoy to this day. Popular varieties include Tropical Turf Mix (80% Buffalo and 20% Couch) and Qld Blue Couch – both grown and supplied by Harden Park Lawns. Spraying for all weed types is relatively straight forward for Couch grass as this lawn type has no known bad side effects to any commonly applied selective herbicides. Couch grass has a very rapid growth rate and this is the reason why the grass is so much cheaper to purchase than all other lawn types. As a turf farm we can relatively quickly grow a new batch of Couch at almost twice the speed of other grasses. This rapid growth rate of Couch is terrific when you have kids playing in the yard or the lawn is subject to other heavy traffic. This lawn variety can easily repair itself from damage. However, there are also downsides to this fast growth. Couch will very quickly invade surrounding paths and garden beds, sending its underground runners deep into the soil and under fences. Lawn mowing is required more frequently in order to keep removing the right amount of leaf to keep the lawn healthy. And lastly, Couch lawns will build up their thatch layers very quickly and so will require vertimowing / de-thatching more often than other grasses in order to keep the lawn green and healthy. Due to its very fine leaf blade, Couch is a very poor grass when it comes to its ability to absorb critical sunlight. For this reason, Couch lawns need to be planted in areas which receive direct sunlight for most of the day. If Couch is ever subjected to heavily shaded areas, the lawn will simply wither away and die. If plants, trees or bushes have become overgrown and are now shading your Couch lawn leaving the grass in poor health, then the excess foliage must be heavily pruned back in order to substantially increase levels of sunlight, and to restore the lawn back to health. If sunlight cannot be increased, then thought should be given to a new purpose for the affected area, such as a garden bed or paving.